qualifications – skills I use in the day to day running of The Sugar Shack. I started The Sugar Shack on August 1 st 2015, whilst still working a part time job. I continued that for a year, until I reached a point that I just couldn’t sustain it any longer… so I took the leap and flew solo! I had originally called my business MKB Catering (so original) – until it became apparent that another business who started after me had similar initials, and everyone was getting so confused. It was time to change…onwards and upwards. The Sugar Shack name originated many years previous in my parents kitchen, where I would spend hours over the stove perfecting my Russian Fudge recipe – paying homage to my Grandad who used to do the same. As soon as I started cooking, I would announce “The Sugar Shack is open for business!”… much to the delight of the recipients! 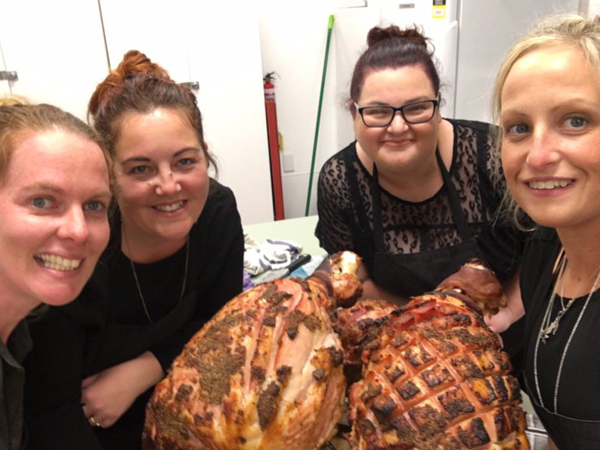 So, whether it is a morning tea, lunch, worksite smoko, dinner… a family gathering or a wedding – myself and my team tailor menus to suit your requirements. We would love the opportunity to work alongside you to make your event a success. In the meantime – The Sugar Shack is open for Business!! The Sugar Shack team with delicious glazed hams.